Do you need to replace or upgrade your old kitchen cabinets? You can give your kitchen an overhaul and change the look and feel just by replacing your kitchen cabinets. It may seem very simple, but a change like this can really brighten up your kitchen space. Building your own kitchen cabinets allows you to experiment with different colors, woods, textures and feels. It can even be practical to do. It doesn’t have to be expensive. You can save money on the replacement by doing this project yourself. If you enjoy home improvement projects then this will be a breeze for you. With a good plan, the right tools and some patience you can build your own kitchen cabinets. Here is how you can build your own kitchen cabinets. Continue reading below to find out how. Measure the dimensions on your kitchen. Make a to scale drawing that includes the details of your cabinets that you want to replace or build. Use the cabinet building plans that are available, in books, or even at improvement stores. Take a trip to your local lumber supplier that makes cabinets. You’ll find a large selection of materials to consider for this cabinetry project. Look at the many different types of finished wood they have available. Pay attention to the price. Which wood do you like the best? 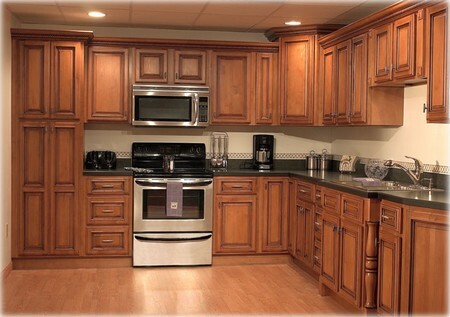 If you are making plans to paint, stain or glaze the cabinets, then you can choose to use the inexpensive wood. Choose a wood that will compliment your current décor and enhance your living space. After you have decided which wood best compliments your current décor and suits your needs, give the measurements that you took of your old kitchen cabinets to the lumber store employee. The person will help you come up with an estimate about the total coast of your cabinet project. Make a final draft of your kitchen cabinet dimensions and measurements of your cabinets. Double check that your cabinets are arranged correctly. Rearrange as need to utilize all available space. Write a detailed list of necessary supplies. Include the exact dimensions of the wood pieces you will need. You can buy your cabinet replacement supplies from any home improvement retailer like Home Depot or you can go to a lumber suppler to get your cabinet materials. Construct your kitchen cabinets according to your step by step plans. Stain or paint your new, finished kitchen cabinets. Follow the manufacturer’s instructions that came with each individual product. Enjoy your new kitchen cabinets.